President Vladimir Putin on Tuesday warned Russia could defeat any aggressors but insisted that the world come together to fight "terrorism" as Moscow marked 72 years since victory in World War II. Soldiers and military hardware paraded across Red Square in Moscow as the country held its annual pomp-filled celebration of the defeat of Nazi Germany in 1945. 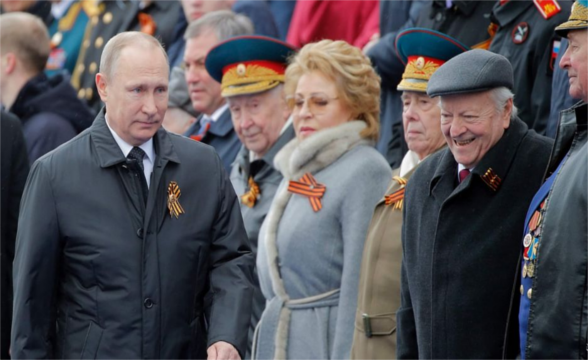 "The lessons of past war force us to remain alert and the armed forces of Russia are capable of warding off any potential aggression," Putin said as he presided over the parade. "Today life itself requires us to increase our defensive capability, but for an effective fight against terrorism, extremism, neo-Nazism and other threats it is necessary to consolidate the whole international community." The Kremlin strongman insisted that Russia was "open for such cooperation" and that Moscow would "always be on the side of the forces of peace and with those who choose the path of equal partnership." Under Putin, celebrations of the Soviet Union's immense sacrifice in World War II has become a key rallying point for society with authorities fiercely seeking to control the historical narrative. "This monstrous tragedy was not prevented primarily because the criminal ideology of racial superiority was tolerated, because of the disunity of the world's leading countries," Putin said. There "is no, there was no, and there will be no force that can conquer our people," he added. "We will never forget that the freedom of Europe and long-awaited peace across the planet was won namely by our fathers, grandfathers and great-grandfathers." The Victory Day military parade is also a major chance for Putin to showcase Russia's military might as the country has poured vast sums into bolstering its forces. In a hiccup, however, organisers said they were forced to cancel the traditional fly-by of helicopters and warplanes over Red Square due "adverse weather conditions" as heavy clouds covered Moscow. As soldiers paraded in cities across the country, Moscow's forces at its Hmeimim air base in Syria also held a ceremony. Russia has been pushing for the West to join forces with it in Syria to battle "terrorism" but has faced fierce criticism for backing leader Bashar al-Assad. Ties between Russia and the West have slumped to their lowest point since the Cold War over the crisis in Ukraine, where Moscow seized the Crimea peninsula and has backed insurgents in a bloody conflict.